1997: Looking Back At SPEED 2: CRUISE CONTROL | Warped Factor - Words in the Key of Geek. By all accounts Keanu Reeves upset a lot of people in Hollywood when he turned down the offer to star in the sequel to Speed. Stories went around saying that, because he was essentially biting the hand that fed him, he would never work again and he'd missed his chance to capitalise on the success of the original. But, as we all know, Reeves passing on this film was probably the best career decision of his life. It was also a great decision for Sandra Bullock, as she now held all the cards and commanded an enormous pay day to reprise her role of Annie Porter. Of course, her official word was that she wanted to do Jan De Bont a "favour", since she got her big breakthrough in Speed, which he also directed. I don't buy that for one minute, I think both her and Keanu had read the script in advance, Reeves bailed and she saw dollar signs. After all, if you are going to do someone a favour and it turns out to be a career destroying one then you may as well get paid handsomely for it. And it very nearly was career destroying for Bullock, it would take her a succession of luke-warm features and four years before she hit again with Miss Congeniality. This is pretty understandable, because Speed 2: Cruise Control is really, really terrible. 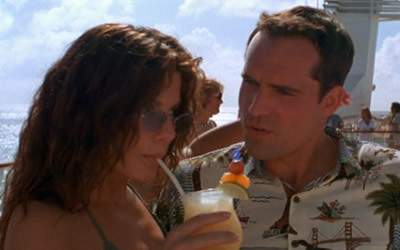 Here, Sandra has a new boyfriend, played by Jason Patric, but there's plenty of references to Jack, because, well, I think that De Bont forgot that Reeves wasn't in the film as Patric's character, Alex Shaw, is also a SWAT Team Officer. Coincidence? Or just lazy scripting? Anyhow, Annie Porter clearly has both a type and a tendency to be at the centre of troublesome situations, because here she is on a cruise to the Caribbean when a madman (Willem Dafoe) takes control of the ship and sets it on a collision course at a slightly-faster-than-usual speed. So Annie and her replacement beau decide to stop the terrorist on their own. 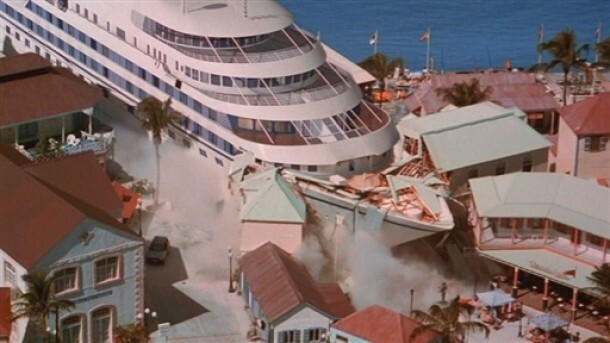 Apparently, De Bont came up with the idea for the film after he had a recurring nightmare about a cruise ship crashing into an island. And nightmare is the operative word to describe Speed 2. The movie itself is way too long, the effects are laughable and the characters are some of the most irritating ever created. Pretty soon, you´ll wish that the whole ship would just sink, like the Titanic, just to clear the decks. Sandra Bullock is very annoying here, Jason Patric is way to dull to carry any film, and Willem Dafoe doesn't do a good job either. You can see why the film has a big budget ($160 million down the drain), and the people behind it obviously had high expectations of it, since it´s the sequel of a very good film, but it doesn't have any of the exciting action that the first one had. 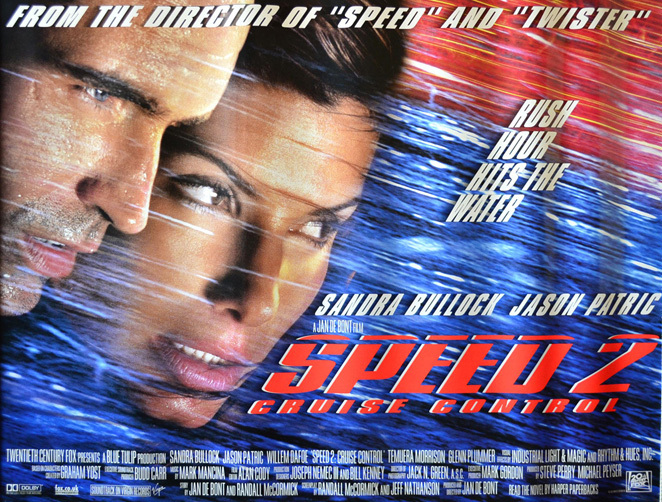 Speed 2: Cruise Control was nominated for eight Golden Raspberry Awards, and won the award for Worst Re-Make or Sequel, so it's not like it was considered, by anyone, to be a good film at the time of release. Twenty years have not helped it either. It doesn't fall into that category of so-bad-it's-good or hold any nostalgia factor to improve it's many, many flaws. Looking back on it now, the only reason Speed 2 is not often referred to as the big box office turkey of 1997 is because the week after it premiered Batman & Robin was released. One can imagine that Jan De Bont sent Joel Schumacher a rather large gift basket!